This guide will show you how to add a new contact to GetResponse when a user submits a Quform form. In this guide we’ll create a new plugin to contain the code needed for the integration to work. Inside the quform-getresponse.php file add the following code. * Description: Add contacts to GetResponse from Quform forms. In GetResponse go to My Account → Account Details → API & OAuth to find the API key. 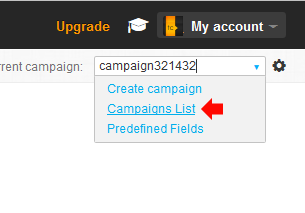 In GetResponse from the Dashboard click on the switch campaign menu and click Campaign List. On the campaign list what you want is the Token value shown below the campaign name. You only want the letters and numbers of the token, not including the colon or comma (for example in the image below the token is aBCde). Download this file and save it as GetResponseAPI3.class.php into the plugin folder you created in Step 1 quform-getresponse. Upload the quform-getresponse folder to the web server at wp-content/plugins then go to the Plugins page within WordPress and activate the plugin Quform GetResponse Integration and you’re done. By default subscribers will not appear in your Contacts list straight away, they will be sent an email to confirm their subscription and only after confirmation will they appear in the list. To skip this you can disable confirmed opt-in for API subscriptions. From the GetResponse Dashboard click the settings icon next to the campaign in the top right corner. Then go to the Permission tab and uncheck the option Api subscriptions.